Herman Miller AO2 is the “go to” cubicle for many companies. Its versatile, easy to install and easy to reconfigure. Its also inexpensive when purchase used. Herman Miller AO2 is the work horse in the cubicle systems world, they last forever. 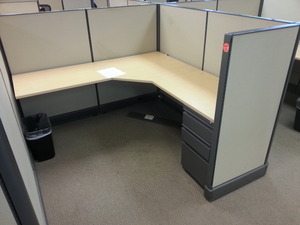 These used cubicles come are 6X6 and 53″ tall and come with a box box file. A few of the cubicles do come with glass inserts. The glass will not last long so act now.